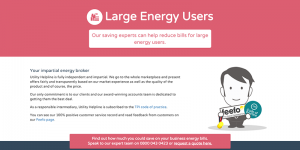 Utility Helpline is an independent energy broker that specialises in finding the right energy deals for small and medium sized businesses in the UK. Managing Director Richard Bonelle started Utility Helpline in 2006 when he saw lots of small and medium sized energy users being ignored by the big supply firms. The company has grown on a reputation for delivering high quality personal service and always going the extra mile to help customers. The Artlab team understood our needs and delivered exactly what we were looking for. I value their input and trust their judgement in making our online presence a success. Utility Helpline has ranked at the top of Google for "water market deregulation" for more than a year. This is thanks in part to content marketing work that was picked up by high authority sites like Forbes. A key market segment for the company, searches related to pubs and energy brokers always feature Utility Helpline. Using some more technical SEO techniques, we configured the website to feature among the top listings for this highly popular search term. Emphasising one of the company's value propositions, we concentrated on getting Utility Helpline to rank for terms like small energy broker and independent energy broker. We were recommended to Utility Helpline by another client in the same industry. 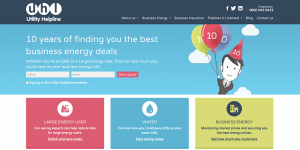 We began SEO and Content Marketing work for Utility Helpline in 2009. The brief was to increase the company’s showing in organic search engine traffic. After optimising the website to perform better in Google and other search engines we began writing content to help push the website up the search rankings. The sheer number of energy companies and price comparison tools (with gargantuan TV advertising budgets) make it very difficult to rank highly on Google. To overcome this, we targeted an SEO campaign around some major search terms. Success with some topics like water market deregulation, pubs and licensed premises means Utility Helpline dominates the results in some key major areas. 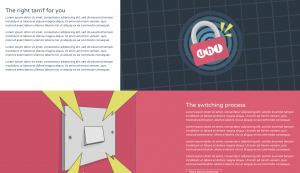 In order to generate more links, traffic and conversions on the website, we also created a series of landing pages designed to inform and sell to customers. Need help with your own web project? We're always happy to talk through ideas and projects.